This is my last post and design team entry for the Midnight Madness Sketch Challenge and priscillastyles Store, as my term comes to an end. Three months has passed by so fast! 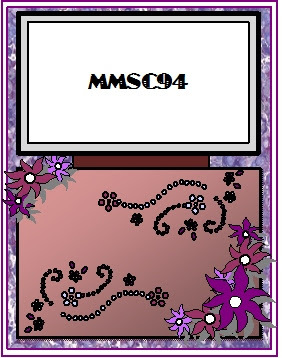 I have enjoyed it all, and thanks to Priscilla for allowing me to use her digital stamps which are awesome! I had the opportunity to stay on the team longer, but I thought I was going to be travelling with my hubby, Mike, more with his job. I found out today that I am having a third shoulder surgery, next Friday, as I have retorn the rotator cuff/bicep again, and worse than before. I won't be able to create for a while, which will give me an excuse to get the craft room cleaned up and organized, with help of course. Here's my last card made for the MMSC, and I've enjoyed all of the other team member's projects! You are all awesomely inspiring! Hubby was in Honduras on a mission trip with some others from church, and he took my camera. I borrowed one, and didn't know the date stamp was on it, and couldn't remove it, so I apologize for that. Well, I am at the end of my six month term as a design team member with Heartfelt Creations, and I cannot believe it's been that long already! There were 19 of us chosen, and we all wanted to remain on the team. HC needed to mix it up a little, so they decided to keep 10 of the team, and add 10 new designers. They are working on chosing the 10 new currently, and that must be a hard job to do with all the talent that is out there in Stampingland! I know it was a terribly hard choice to make concerning which 10 of the current team to keep on, but that in no way diminishes the talent, nor desire to keep everyone on it. I saw, firsthand, how beautiful everyone's creations were by working alongside Emma Lou and Rich at the CKC convention in Louisville, Kentucky, last weekend. The photos that are posted on the website, and on the blog do not do justice to the real items! Since photos are 1-D, they don't show the depth, color, detail, glitter, shine, or texture of the projects. I was able to hold them, touch them, feel them, and see them. What a difference! Each one is a masterpiece, which holds the essence of the maker in its design. I personally, asked HC to choose 10 others that wanted to be on the team first, because I've not been able to do some of the other crafts I love, but also because I knew how much each lady desired to be on the team again. I'm glad I chose to do that, because I found out today that I have to have a third shoulder surgery next Friday, March 25. Apparently, I've torn the rotator cuff even worse than I did the first time. I wouldn't be able to make the project deadlines with one arm in a sling for six months. Heartfelt Creations has been the most helpful, generous and giving company to design for. This was my first time as a designer, and I was blown away (there I go!) with all they did for me during the past six months. Not only did I receive products with which to create my projects, but personal support if needed, friendship and a generous discount. They allowed me to work at the convention, and I was able to obtain some of the items I wanted and needed. But mostly, we just had a lot of fun, fellowship, creativity and laughs! I met Jen who teaches the classes for HC at conventions there, and she's a "hoot"! I can't say enough about HC's customer service, team service, and professionalism. They are just plain uber awesome! I talked with Linda Bontrager (Emma Lou's mom) this morning, and thanked her for everything they've done for me. They'll have a design team "call" every six months, so perhaps after I heal, I can design for them again. Until then, I'll be taking it easy, posting when I can, but not for a little while...please keep in touch with me, and I will continue to check your blogs to see what beauties you're creating! My email address is muttpuddles@comcast.net. Please email me and let me know how things are going! Each and every lady on the design team is a new friend of mine, and I want to know how and what y'all are doing! Hello, Friends. Have you noticed that as we grow older, more of our friends and family are getting ill, injured or dying? I'm sorry to bring this up, but it is a fact of life. I do not like making these cards, but am finding "Get Well" and sympathy cards are needed by me more and more often. I guess that's the circle of life also. Here's a sympathy card I made for Heartfelt Creations, with directions on how to make it. Directions: Cut card base from white cs. Set aside. Cut card front from patterned paper. Cut oval with die from Pear Pizzazz cs. Cut rectangle 4 1/2" x 2 1/4". Adhere oval to left side of card front (opening at bottom) and rectangle on right side lapping over oval. Use sewing machine to border the rectangle. Use border punch on long edge of white cs. Glue one scrap from punching to front over stitch line. Glue ribbon around straight edge of punched scrap on front. Make bow. Stamp one large leaf and two medium leaves on Pear Pizzazz cs in pear ink. Use markers to accent lines, edges and tears on both. Cut out around lines. Fold large leaf in half & roll edges around a small paint brush to bend. Apply dimensionals on back along edges. On small leaf, use dimensionals to apply sentiment stamped in cocoa ink on white, sponged with pear & guava ink, matted on scrap piece of patterned paper. Stamp one each of the flowers on Cameo Coral cs. Using markers and chalk, highlight the petals on each. Cut out, and cut on lines between each petal on all. Score each petal down center and crease, then fold outside corners down with paint brush. Edge each petal with glitter spray using paint brush. Let dry. Use dimensionals to stack each flower on top of the next in size starting with the largest. Tie bow with floss in holes in button, glue to center of small flower. Glue front panel to card base and apply leaves, flower and bow. On inside - Stamp flowers on right side of inside, after "stamping off" on scrap paper. Cut piece of patterned paper 5" x 6", glue to left side of inside. Trim extra paper from edge if needed. Glue piece of border scrap along bottom. Stamp sentiment on white cs, "stamp off" flower images, sponge edge with pear ink. Cut with Labels 5 die. Trace around die on cameo cs, cut out, & glue sentiment to it, leaving a 1/8" border. Glue medium leaf to bottom left corner. My last project for the Midnight Madness Sketch Challenge MMSC96 will be posted soon on the priscillastyles Store blogsite. I have had the pleasure and challenge of working with digital stamps drawn or created by Priscilla bi-weekly, for the last three months. I have really enjoyed it! I've also really enjoyed seeing the creations that the other team members have made, and also ones that you out there in stampland have made and posted. Priscilla has really been patient with me regarding blog booboo's, and forgetting to post a card by a deadline, and has helped me do just regular things on the computer than I was confused about. She's not only a great artist, but a computer techie, too! Thanks, Priscilla for everything you done, and for the digi's! I'm glad that I was able to finish my term before my shoulder surgery next Friday. Take care Priscilla and team members! I've enjoyed it! Hello, and welcome to Scrap-Mart's week long mini-blog featuring Heartfelt Creations products! Below is the schedule of the posts that Scrap-Mart will put on their website in the "Blog", and you can link to each person's blog page from there. Today features myself and two other very talented ladies, Debbie Sayer and Lisa Gregory. Just click on Debbie's name to go to her blogsite to view her beautiful creation, and then you should be able to go to Lisa's from Debbie's site. The Dutch Iris-Blossom 3 Collection debuted yesterday, at midnight EST. There are 7 new PreCut Sets. These new sets coordinate with a new exclusive Heartfelt Creations die, made by Spellbinders, and 2 dies released by Spellbinders at Winter CHA. These are the most beautiful, and in my opinion, the best sets produced yet by Heartfelt Creations! nearly identical to the stamp's flowers to make it look more 3-D. This closeup shows the dimension of the flowers, butterfly, and the detailed stitching. background is HCPC 3372 Dutch Iris Frame PreCut Set. This closeup of the iris shows the detail on the "stamens". I love irises and this stamp! I have been working on another card I wanted to post, but didn't get it done in time. I'll post it in a few days. I hope you have a blessed week, and have enjoyed hop, hop, hopping! Come back to the Scrap-Mart blog tomorrow to see what the next three gals have in store for you! Thanks for visiting! Hello again! I really enjoyed the challenge this last week from "priscilla styles" store, Butterflies are one of my favorite creatures made by God! Thank you, Priscilla! I hope you'll go to Priscilla's blogsite (just click on the link above) and view all of the designers projects, and then leave a comment of love on each. If you've made a card and would like to share it, we'd like to see it. Click here to visit the Midnight Madness Blog. We sure appreciate each and every one of you that visits! Here's the sketch, then below that is my card. Thanks for visiting, and we hope you've enjoyed the view! Come back again, soon! Scrap-Mart Weeklong Heartfelt Creations Blog Hop! Hop, Hop, Hop! Please come and join us for a Heartfelt Creations blog hop, sponsored by Scrap-Mart! This hop will be all week long, and each day will feature three design team member's work with Heartfelt Creations products. There is some amazing work to see, and be inspired by! Please drop by each day, and leave a love comment! We love to hear from you. Now, if you're in love with the Heartfelt Creations images, just wait until this Tuesday, when the new stamps and dies in the Dutch Iris-Blossom 3 PreCut Sets will be released! Here's a sneak peek. The Dutch Iris-Blossom 3 Collection will debut on March 8, 2011, at midnight EST. There will be 7 new PreCut Sets. These new sets will coordinate with a new exclusive Heartfelt Creations die, made by Spellbinders, and 2 dies released by Spellbinders at Winter CHA. Hello, Everyone! So glad you could join us for fun and inspiration! We are happy that we could take this time to blog hop with you! Here is the order of the hop, so put your seat belts on, and hang on for a fantastic ride with some very talented ladies! If you've started here, you're in the middle, so you probably need to start with Linda here. If you've come to me from Giovana, then you are in the correct place! As you visit each one, please leave some love in the comments section! My first card is one made for Linda B. I used the new Stained Glass Background PreCut Set, Product ID: HCPC 3364, Hydrangea/ Posy Branch PreCut Set, Product ID: HCPC 3301, and Elegant Single Leaves PreCut Set, Product ID: HCPC 3314. Next up on the blog hop is, Anita! You can go directly to her blog site by clicking here. Have fun, and don't forget to leave some comment love for each designer! Thanks for visiting, and I hope you come again!